Effect. Performer sketches a picture or cartoon on a sheet of white paper, with a border all round it, which is then taken off and rolled up tube shape. Now, after a few passes, the paper is unrolled, when the sketch or cartoon is seen to have vanished. Procure two boards each of which is the size of an ordinary black board, and a quarter of an inch thick, these are now placed together in such a way as they will have a space of half an inch between them, the top is left open. 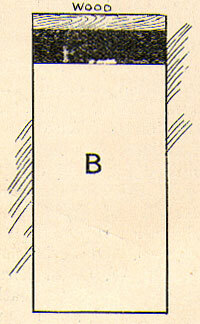 The front of the board has a slit in it that will allow the small sheet of paper (B) to pass through it. The board is now painted black to give it the appearance of an ordinary black board, one inch thick. You now procure a sheet of white paper, with a black border painted all round it, the size of the board, this is now placed on the board with four drawing pins, the top of the paper on a level with the slit in the board (not over it). You now take the piece of paper (B), which has a black border at the top only, the white part of this slip is the exact size of the white centre of the sheet of paper on the board, the black border is also the exact size of the top border on the paper. 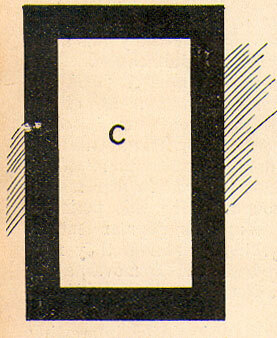 The border end of this paper (B) is passed through the slit in the front of the board, and out through the top. A slip of wood is now glued to the paper and left to dry. 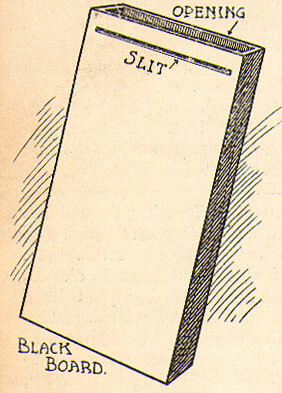 When dry the white end of the paper is drawn through slit down over the while centre of the paper on the board. This is now kept in position with two drawing pins. The paper then appears as Sketch C.
The trick is worked as follows :— Peformer sketches a picture or cartoon. When finished, he removes the four drawing pins that holds the two sheets of paper at the bottom of the board and also draws the ends of the sheets of paper up to the top of the board. While holding them in this position, he releases his hold on the sheet of paper with the sketch on. The moment he does this, the weight of the slip of wood draws the sheet of paper through the slit into the space between the board. Performer now re¬moves the two pins that holds the large sheet of paper. He now removes this sheet from the board in such a way that the audience cannot see that it is a blank. It is then rolled tube shape. After a few passes the paper is opened out and shown each side, when the sketch is seen to have vanished. The black board is also shown back and front.